Send a taste of home to your deployed soldier this holiday season and surprise them with a dessert in a jar. These sweet treats are baked and sent in mason jars, giving your soldier something to enjoy that is not only delicious, but is also homemade. While some baked goods can spoil when sending overseas, with the proper preparation and sealing, these mason jar desserts should stay fresh during shipment. 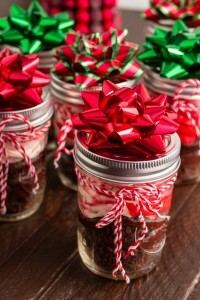 For an extra special touch you can decorate the jars with twine or ribbons and add a note tag with a personal message. Wrap each jar in bubble wrap and send a few in your next care package! Make sure you are using jars specifically designed for canning. Wide-mouth mason jars are the best choice. They are made with tempered glass and are sold with lids and rings. Mason jars, rings, and lids must be washed before filling. You can wash them in the dishwasher or by hand with hot soapy water. Just before your dessert is done baking, boil the lids (the flat part) for at least 5-10 minutes. The gummy ring on the lid needs to be softened in order for it to create an airtight seal. And don’t forget about safety – use tongs to remove hot lids and be sure to wear oven mitts. Cake in a jar – This helpful step-by-step article gives you all the basic instructions you need to bake a cake in a jar. Pumpkin pie in a jar – A yummy holiday favorite! Bake a perfectly portioned pumpkin pie in a jar, complete with pie crust. Banana bread in a jar – Your soldier will go bananas over this easy-to-make sweet bread. You can also make zucchini bread. Brownie in a jar – A decadent delight and the ultimate goody for the chocolate lover. For more holiday gift and cooking ideas, visit the Omni Financial Winter Holiday Celebration Ideas board on Pinterest.